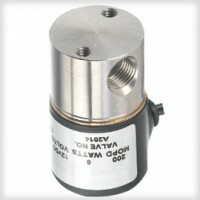 The AS Series is a 2-way isolation solenoid valve, designed to control the flow of various aggressive liquids and gases with several body and diaphragm materials. With a modular design, the AS offers performance, flexibility, and the protection your media needs from the solenoid’s internal components. Numerous port configurations, voltage options, and coil constructions enable the AS Series to be a truly versatile miniature inert isolation valve, easily integrated into any complex or demanding system.